It's been a bit more than a year since the massive U.S. Stimulus Package-the American Reinvestment and Recovery Act (ARRA)-was introduced by President Barack Obama. In that time, the Stimulus Package has delivered results, spurring a number of renewable energy projects, notably in the solar power area. In a project backed by the ARRA, the City of Wilmington, Delaware, recently installed the first of two solar photovoltaic arrays. When finished, the solar installations will consist of approximately 3,400 panels and generate nearly 950,000 kilowatt-hours of electricity annually. The Sharp 230W solar power modules are connected in arrays of 13 panels each. Xantrex G250 inverters are being used on the project. The solar project is Phase 1 of a broader $14.5-million energy retrofit and renewable energy program to further decrease utility costs and greenhouse gas emissions tied to city-owned facilities and infrastructure. The program will help the city meet the environmental commitments it adopted as part of the U.S. Conference of Mayors Climate Protection Agreement. It will also reduce electricity consumption by 2.8 million kilowatt hours a year (enough to power 260 homes annually) and decrease carbon dioxide emissions by approximately 4.4 million pounds per year (comparable to taking 380 cars off the road). In addition, it's expected to create or sustain more than 80 jobs. An exciting aspect of this program is that it's guaranteed to pay for itself. The program is structured as a performance contract, meaning that the provider, in this case Honeywell Building Solutions, is guaranteeing the city that the entire program will pay for itself from the energy savings derived from the upgrades-approximately $1.14 million in savings per year under a 20-year performance contract. This is a big plus for any city during tough economic times. In this case, Wilmington can have the upgrades without impacting the city's budget or requiring more taxpayer dollars. And if the savings don't come through, Honeywell will cover it. Honeywell, however, is not too worried about having to come up with any money. The company expects the project to generate $16 million in savings above the guaranteed amount over the course of the contract. Wilmington is taking a comprehensive approach to their renewable energy program. After the two solar arrays are complete, they will move on to Phase II, upgrading their wastewater facility. 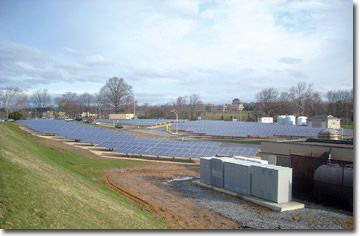 The City of Wilmington, Delaware, recently installed the first of two solar photovoltaic arrays. 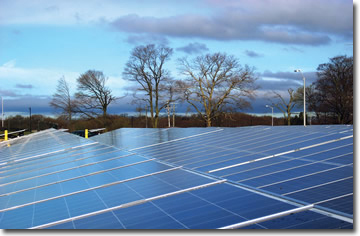 The Sharp 230W solar power modules on the project are connected in arrays of 13 panels each. 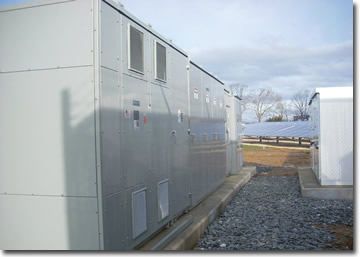 Xantrex G250 inverters are being used on the project. "This is a good example of infrastructure in a state of decline that needs attention regardless of what's going on in the economy," says Ron Blagus, energy services marketing director for Honeywell Building Solutions. "In order to try to make those repairs, the city is contemplating upgrading their pumping system, which is a very heavy user of electric power. They also want to capture the methane that is a byproduct of the wastewater facility." Honeywell is helping the city look into using methane to drive an engine that will create electric power to use on site, and also use the waste heat (which there is a lot of) to dry the bio-solids-the end product in the wastewater facility. Bio-solids are normally taken to a landfill wet. Dry, they will weigh considerably less and save the city in tipping fees. Honeywell is also looking to see if Wilmington will be able to sell the methane emissions as a commodity. "Wilmington won't know the answer until the project is complete, but there is a market for greenhouse gas emissions," says Blagus. "If it makes sense, we'll capture, audit, and verify the prices of those methane emissions and trade them on one of the exchanges or trade them to a compliance buyer." Helping municipalities develop comprehensive programs to reduce utility bills and carbon emissions, and in some cases create revenue streams, isn't new to Honeywell. "First, we make sure that there is always a very good business case for what we do-particularly around renewable energy. We're not big proponents of installing renewable energy for renewable energy's sake," says Blagus. "Generally, though, there is more than one technology that will provide a good economic return. "Because there's a renewable energy portfolio standard for the State of Delaware, we were able to take advantage of those, put the project together, and get a nice economic return back to the city," he added. "At the same time, the city gets to do some infrastructure improvements and reduce their carbon footprint along the way. Everyone seems to come out ahead." Blagus says he sees the same theme over and over-local municipalities really hurting because tax revenues are down, along with wages and employment, while power and gas prices aren't relenting. Meanwhile, the wear and tear on that capital equipment continues. The "deal structure" like the one in Wilmington can be an attractive option for municipalities. The provider puts together a list of projects that are approved by a municipality. Those projects have a stated economic return that will retire the debt that's used to fund the project. It is guaranteed, so a municipality knows its financial obligations can be met. "It's the direction Honeywell is going-locating additional revenue streams for municipalities, not only to pay for upgraded equipment, but if possible, also generate additional capital." Blagus says that a great example of adding revenue-in addition to emissions trading-is through demand/response programs. For example, buildings are commonly looked at as big users of electricity and natural gas, but they can also generate a revenue stream. "By making a building available back to either the grid operator or to the utility company, it creates what's called Negawatts," explains Blagus. For example, on a hot summer day, a utility company may have a difficult time keeping up with its demand and need to go out to the power markets to buy power to make up the difference. That can turn into extremely expensive power. Capacity restraints like this cause utility companies to switch to different rate tariffs, where the user pays a different price for power based on the time of day. A user could conceivably pay up to 10 times more per unit of power than they pay during off peak times. "When buildings are viewed as instruments to be run according to tariff rates or time of use, they can create additional savings by participating in markets. Not just by reducing their use, but by actually participating in the power marketplace," says Blagus. "For end users that want to participate-and, of course, if a utility allows it-the utility may reach the building electronically and start cycling the equipment in a way that's agreed to by the building owner. Power requirements are reduced and there are revenue exchanges as a result of doing it." Normally, the change in comfort is incremental and barely noticeable, but in terms of helping mitigate short-term supply imbalance, it has a lot of value to the utility company. In the end, it's a win/win scenario. Building owners, by properly instrumenting their buildings, can reduce greenhouse gas emissions across a broad base by managing power supply costs, managing rate fluctuation, and driving value back to the building owner. The solar program for Wilmington is structured as a performance contract, meaning that the provider, in this case Honeywell Building Solutions, is guaranteeing the city that the entire program will pay for itself from the energy savings derived from the upgrades. "We're seeing clearly, all across North America and even in other global marketplaces, these new opportunities for building owners, like municipalities, says Blagus. "They not only save money through efficiency and renewable energy, but also by using their building portfolio to participate in the power market. It's very exciting and timely." So how do you choose how to retrofit or upgrade your facility? Honeywell has developed what they call a Renewable Energy Scorecard to help municipalities see what blends of renewable energy would be an ideal fit. "We knew through experience that different kinds of renewable energy are going to create different kinds of economic value. So, we looked at which renewable energies worked best at any location in North America," explains Blagus. Honeywell came up with six types of renewable energy: solar PV, solar thermal, wind, geothermal, biomass thermal, and biomass electric. The modeling program (the Scorecard) enables them to tell a company during the first conversation which renewable energies are likely to work. "The Renewable Energy Scorecard helps building owners make smart decisions, and we both don't spend a lot of time investigating technologies that are not likely to create economic value," says Blagus. Is it possible to upgrade infrastructure in the facility and take advantage of any federal government funding that would be available to support that? Will the project have a reasonable finite payback-10 to 15 years? Because the technology will need to pay for itself, can renewable energy make a solid economic contribution based on that formula? Are there opportunities to instrument buildings to participate in "forward market auctions"? Are there opportunities to participate in any programs run by the utility company? Can buildings be retrofitted to operate more efficiently and make employees more comfortable and safe? Are there other ways to create revenue with buildings? Is there a way to generate sufficient emissions credits to participate in the emissions trading? "The real question is, can municipalities continue to move forward even as they are challenged with a tax revenue issue that's not going to change overnight?" says Blagus. "Hopefully the economy improves and that burden will ease, but there are no assurances. What can be done to deal with the deterioration of buildings now?" For Honeywell, Wilmington is a positive example of a city that is looking for answers and finding them in a tough economic climate.